I have suffered from foot pain for many years, and despite sitting at a desk all day, I would get home and want someone to rub my aches and pains away magically. I can’t imagine what pain I would have been in if I had a job where I had to stand up all day. Unfortunately, there was dinner to prepare, kids to take to soccer practice and all of the other chores I had to do before I could sit and relax and rub my sore feet. I was making a dangerous situation worse by ignoring and not treating my plantar fasciitis pain. It would have been great if I could have sat for 10 minutes and used a product like the . These foot care devices are designed to be quick and easy to use (just 15 minutes for a standard session) and come with lots of extra features that my bare hands or massage ball cannot compete with. Things to consider before buying a foot massager. 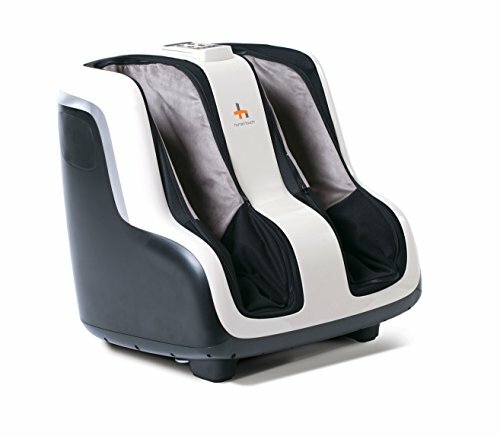 A foot massager allows you to sit and have your feet soothed with a gentle kneading action and some models are heated too. They are a great way to relax at the end of the day, or even for when you need some quick recuperation during the day.They are ideal if you suffer from plantar fasciitis, heel pain, neuropathy or any lower leg or ankle pain. If you are a runner, they are an excellent alternative or complement to doing stretches after your run, plus those of us who are getting on in years will find a foot massager useful to help stay on your feet for longer each day. Don’t use one if you are injured. If you have any injury to your feet or ankles, then I don’t recommend using a foot massager. Even on a lower setting, it could cause you more problems. At the most, you can choose to use the heating function which might help reduce any pain or swelling. If you do have an injury, try utilising some ice on the affected area and take some anti-inflammatory medication. Firstly, it gives you a shiatsu foot massage focusing on pressure points to relieve pain and tension. Secondly, the position of the device can be changed to allow a deep massage of your calf muscles which will help reduce the stress that can make plantar fasciitis worse. I have made this summary of the pros and cons of the CloudMassage so you can quickly review if it is right for you. Provides a heated massage helping you reduce pain and tension in your feet and ankles. Can be used to massage your calf muscles to reduce tension and strain on your Achilles tendon. The vibration helps promote blood flow to your feet, which is great for diabetics or neuropathy sufferers. More comfortable than other massagers, allowing more freedom to position your feet and legs. Some people can find the massage functions too rigorous. 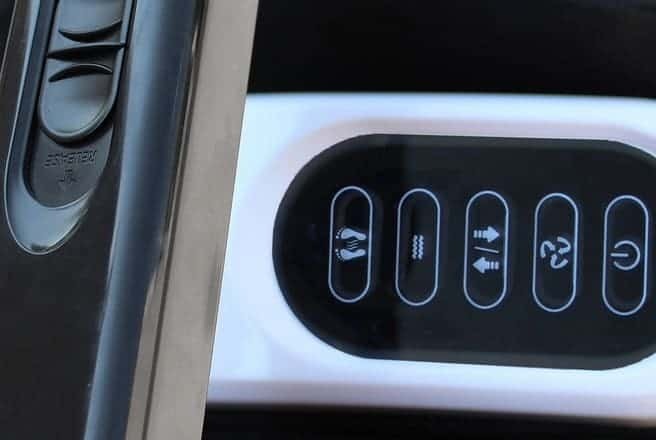 If it had a remote control to adjust the heat and massage settings, it would be useful for people with mobility issues. The device can be cumbersome and requires some space to use. The calf muscle massager may not be big enough to accommodate people with bigger legs. The CloudMassage foot massager features heating elements that will keep your feet warm when you are using it. The heating is designed to help warm up tight and sore muscles, tendons and tissues making the massage more effective. The level of heat can be controlled using the buttons on the massager, so you can adjust it to what feels best. A warmer setting can be used to help boost blood flow. Having a vibrating pad or points is a feature you will find on most foot massagers. The vibration helps to stimulate blood flow, release tight muscles and smooth out any tension. It might take some getting used to, but once you have experienced the heated massage heads rolling around on your aching feet, the added vibration will send you off to foot-heaven. Many foot massagers sit on the floor, and you put your feet in, and it does it’s thing.All well and good, but what if you want to have your feet at a different angle so you can stretch out? Or what if you had a lower or higher chair that you needed to use? 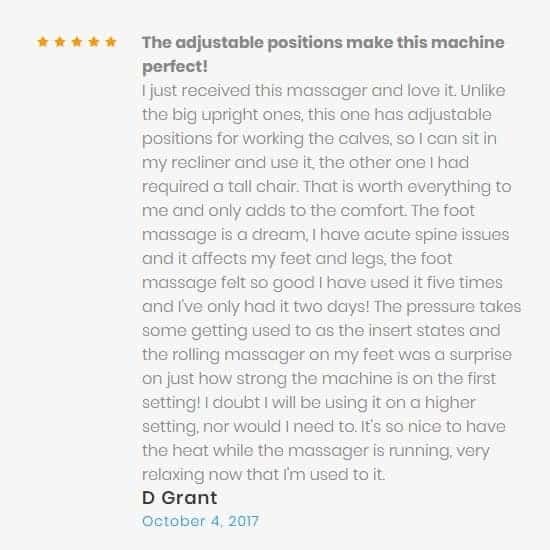 Most foot massagers are not adjustable compared to the CloudMassage.The bar at the back of the device allows you to position it the most comfortable angle for you. 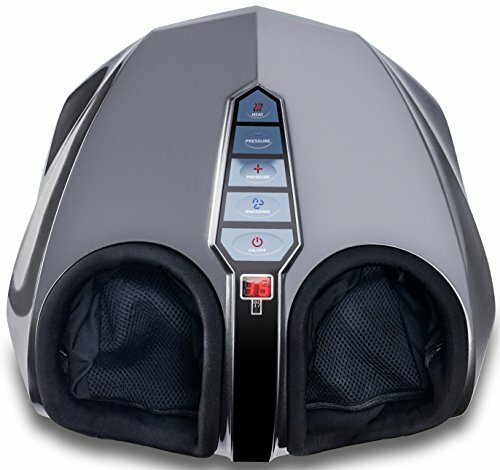 Unlike other foot massagers, the CloudMassage features a unique air compression system that inflates around your feet and legs. Rather than having a defined “hole” that you put your feet into, the inflatable cushions come around where you put your feet to hold them in place. The compression feature makes the massager more comfortable and easy to use as it allows an amount of wiggle-room for where you are putting your feet and legs. The air compression also acts as part of the massage technique, squeezing and kneading your feet. It is an excellent complement to the feeling of the shiatsu pressure point massage on your feet. Compared to other machines, there are different ways your feet are looked after. The heat keeps your muscles and tendons warmed, the “rolling ball massage” on the soles of your feet and the cushioning from the air compression. All of these combined will show your feet a great time! To access this mode, pull down the securing bar at the back of the machine to tip it forwards at a 45-degree angle. You can then put your legs into the same part as your feet would go for a deep tissue massage. Research has shown that treating problems like plantar fasciitis and heel pain can be helped by regularly stretching your calf muscles. The CloudMassage device will help keep your legs supple and free from knots and tension. Of course, you can also use the air compression and heated modes with your legs too, so this will be good if you suffer from any leg pain, tendonitis or neuropathy. Let’s face it, most people who need regular foot massages either have medical problems or are older. Some medical conditions where keeping nerves working, blood flowing and being as mobile as possible is paramount, need regular intervention. This is where a foot massager comes into its own. They are cheap to buy, easy to run, not too complicated to operate and are small enough to tuck away in the corner of the room without being an eyesore. However, us mid-life runners or younger waitresses, shop workers or security guards who are on their feet all day need them too. Investing in the health of your feet is not something to be ignored. Taking the time at the end of the day to massage your feet in a machine like this will work wonders for your overall health and wellbeing. 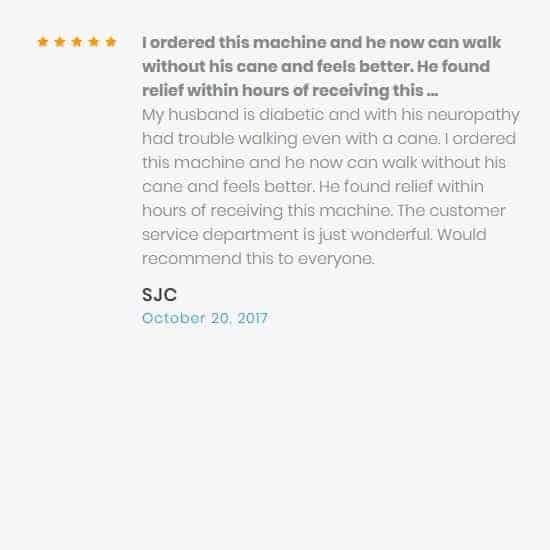 After reading so many good things about what this machine can do for foot health, I wanted to see what people were saying about it online to get a balanced review. 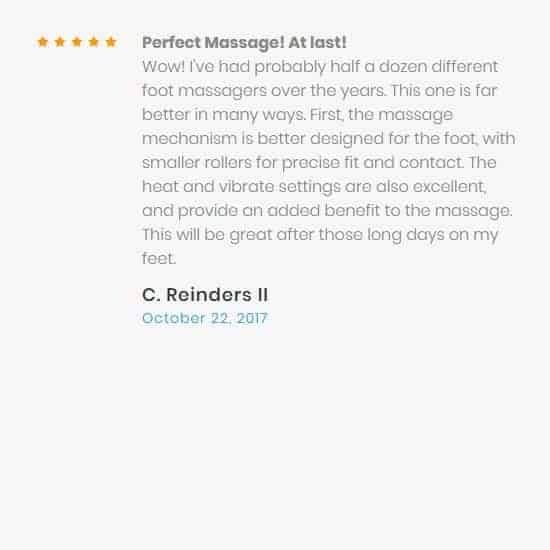 Overall, the reviews are very positive with people reporting that the CloudMassage helped with their foot pains and associated problems. There are reports of people with medical problems such as diabetic nerve pain getting relief from their symptoms as well as praise from people who are on their feet all day. If you have read the benefits of the CloudMassage and are still not 100% convinced, then we can look at some alternative options that might suit you just as well. This product from Miko is what I would call a standard foot massager. There are holes for your feet to be placed in and the heated massage pads and air compression cushions help your feet recover from a hard days work. The main differences between this and the CloudMassage are that it can only do your feet, not legs too, which may be a drawback if you are looking to improve overall circulation and blood flow. A good selling point is that the Miko has a remote control, which is sadly missing from our recommended product, so this could be good for people with reduced mobility. Cheaper option if you don’t need a massager that work your legs too. Human Touch is a well-established brand that you will have heard of if you have ever looked for a reclining massage or gravity chair. 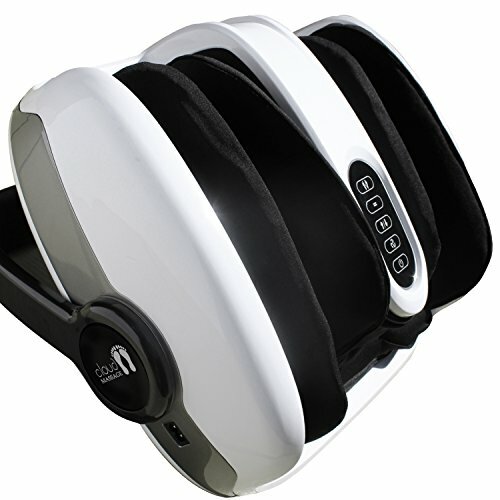 With the Reflex-4, they have brought their knowledge and experience to a portable foot and leg massager. This product is similar to the CloudMassage in that it can also be used to massage your calf muscles as well as providing a reflexology massage for your feet using patented technologies. One main difference is that this device does not offer any heating for your feet and legs, which may be a drawback if you want a massage that helps relieve muscles stress and tension via heat. It may not be to everyone’s liking though, so if you find the heat uncomfortable, you can opt for a model like the Reflex-4 that is a basic foot and leg massage device. A cheaper, simple no-frills foot and leg massager. Bulky design and not easily adjustable. Hot on the heels (pun intended) of the Human Touch Reflex-4 is their Sol foot and calf massager which adds all of the missing features you might expect in a top-of-the-line product. The Sol adds heating elements so that you can benefit from warming your feet and legs during the massage, which is excellent for people with circulation problems. 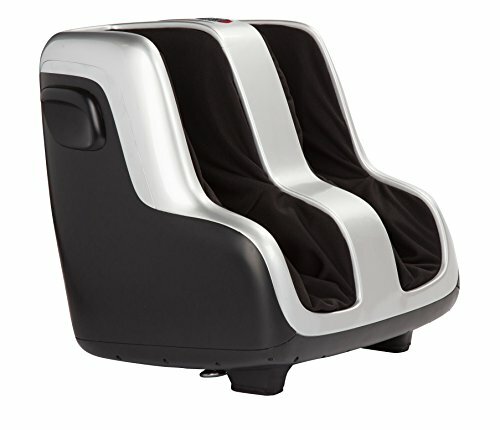 If you are worried about your foot massager getting dirty, the Sol allows you to remove the sleeves that your legs go in. You can then have them cleaned properly rather than just rubbed down or wiped like other models force you to do. Features heating and massage functions. Made by Human Touch, a well known brand. Conclusion – why should you buy the CloudMassage? Having a CloudMassage is ideal if you suffer from sore feet, heels or calf muscles. If you have a job where you are on your feet all day, you will be racing home to kick off your shoes and have a relaxing massage. If you are suffering from a medical issue such as diabetes or blood flow problems, this massager will be ideal as it will help stimulate blood flow as well as soothe your aches and pains. You can use heat and vibration as part of your massage. There is an easily adjustable stand so it can be put at different angles to make your massage as relaxing as possible. You get a deep calf muscle massage too. There are some great stories and reviews of the CloudMassage over at Amazon so click here to read more about this fantastic product.